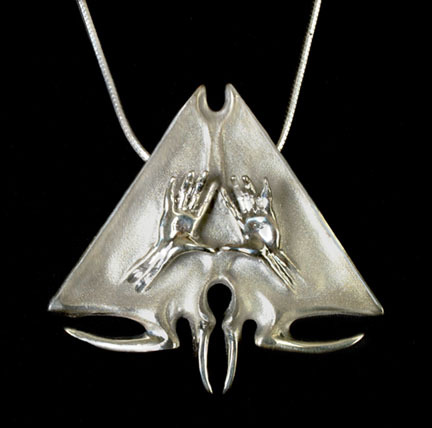 The design of this pendant is based on Giger's 1967 sculpture by the same name. The original wall sculpture measures 63 x 80cm and was produced, at first, in polyester, then later in metal. This background information is provided only to explain the origin of this pendant design, which is also available as a beautiful belt-buckle and as a ring. There were only a few of the original sculpture produced. *Please note, that all items are normally cast to order. As the shop needs a quantity number, it states that we have the items in stock. That might be true some occasions, but please allow us for a longer shipping time, if the item has to be cast upon your order request. 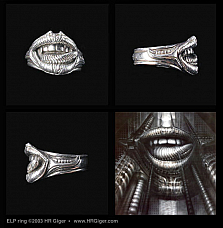 Based on HR Giger's 1998 sculpture, Birthmachine Baby, this sterling silver ring was meticulously ha.. 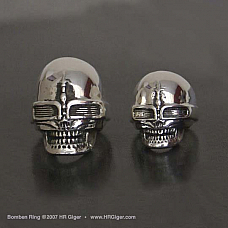 The Bomben Skull Ring is the first and only authentic H.R. 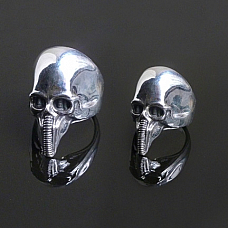 Giger skull ring, a detailed recreation&n..
Sterling silver, 2.25” x 2” x 1” in. (5.5cm x 5cm x 3cm) Sold without chain. *Please note, that al..
Sterling silver 4,25" x 3" x 1,5" (11cm x 7,5cm x 4cm) Sold without chain. 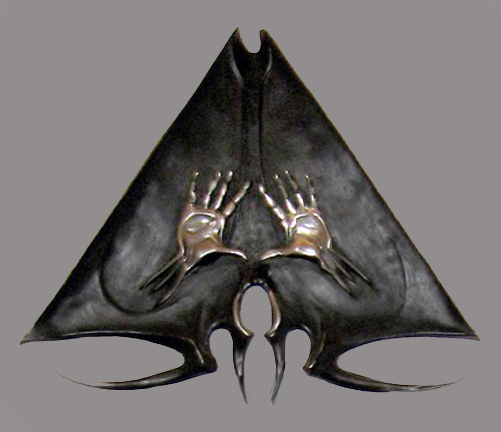 *Please note, that..
Emblem for a Secret Society Ring - Sterling silverThe design of this ring is based on Giger's 1967 s..
Tattoo Biomechanoid Ring - Sterling silver - Fits All Sizes *Please note, that all rings are cast ..
Sterling silver, 1.6" (4 cm) toe to toe. 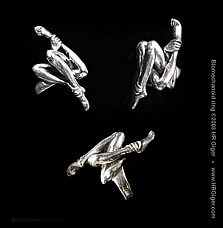 *Please note that all sized rings are cast upon the receip..
Sterling silver, 5/8" (1.5 cm) height. *Please note that all sized rings are cast upon the receipt ..
Sterling silver, 3.25" (8.3 cm) tip to tip. High polish or satin finish. Sold without chain. *Plea..
Sterling silver, 1.5" (38mm) widthSold without chain.The design of this pendant is based on Giger's ..
Sterlling silver, 1.6" (4 cm) toe to toe. Sold without chain. *Please note, that all items are nor..
Sterling silver, 2" (5cm) toe to toe Sold without chain. *Please note that all jewellery items are c..
Sterling silver, 1.75" (4.5 cm) tip to tip Sold without chain. *Please note, that a..
A powerful symbol since its purported debut seven centuries ago, Baphomet has attracted artists from..
A heavy weight replica of the skull crowning H.R. Giger's iconic Harkonnen Chair. Sterling silver. ..
*Please note that all sized rings are cast upon the receipt of your order. Allow 2 - 3 weeks for pro..
HR Giger's name in the typeface he designed for the logo of the Museum HR Giger in Gruyeres, Switzer..